Oh Monday. I feel like I did so much today that it’s already Wednesday. My Monday started last night with a massive and intricate grocery shop at Whole Foods. Lavender buds, arrow root flour, garbanzo bean flour and massive amounts of coconut oil was purchased for a big spring themed Purely Elizabeth shoot. We are working on recipes and content for their spring digital magazine this week! Today we shot 6 recipes and 1 lifestyle scene for the potential cover. I lovely Purely Elizabeth’s aesthetic and their photos are always so bright and clean. They are totally a breath of fresh air when I have to create a ton of content. We even managed to get a workout in this evening. My whole body doesn’t want to move for like 12 hours and I am 100% certain I will probably fall asleep on the couch tonight. While today was exhausting, I am so happy to know that I’m working for myself and doing well. Going on your own can be quite scary for the first few months but these big client shoots make me realize I’m doing something right! The rest of this week will be spent working on content for The College Housewife. I’ve got a few more Eastery posts that I would love to get through for this month! I was also informed that I could host Easter for my little family if I wanted and I am so excited! It is my first holiday that Jared and I will host together and I think we’re going to nail it! I’m still working on the menu, but I’m totally excited for it! 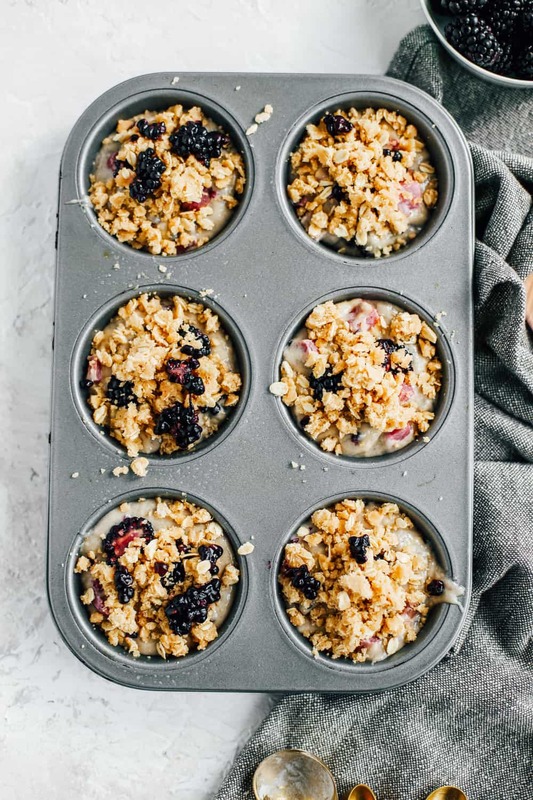 I’m going to get like RIGHT into these blackberry and rhubarb crumble muffins because they are seriously the most perfect spring muffins and tomorrow is the FIRST DAY OF SPRING! YAY! This week I am going to start on some herb and tomato planters to kick off the season. I can’t wait to bet back on the patio and back on the biggest rose kick! We really love muffins over here on The College Housewife. Notable mentions are these blueberry muffins and these honey strawberry muffins! 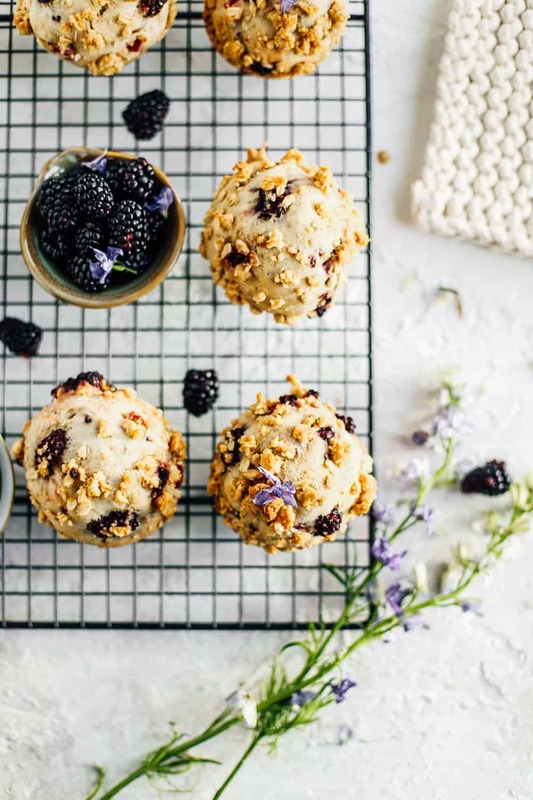 These blackberry and rhubarb crumble muffins NEED to be on your table for any spring parties. I’m talking Easter, Mother’s day and pretty much any brunch! 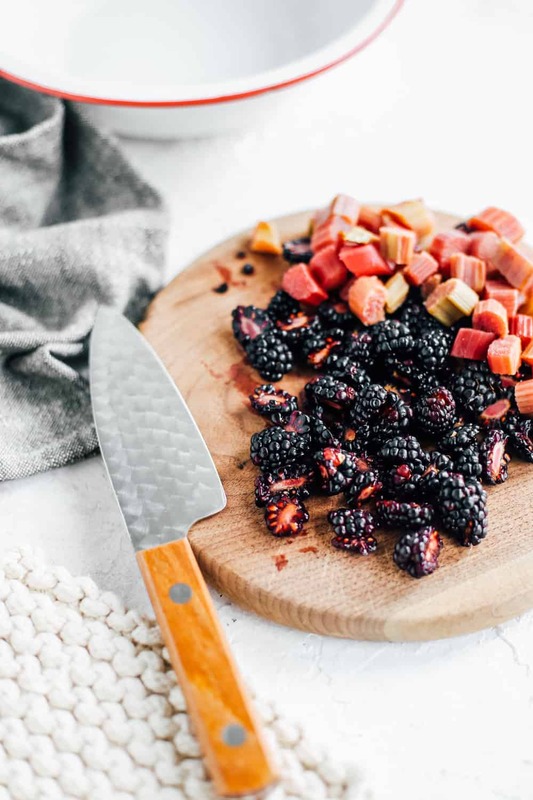 They are packed with juicy blackberries and tart rhubarb chunks (so happy rhubarb is back!). They are laced in a classic vanilla muffin batter but the best part is the topping! 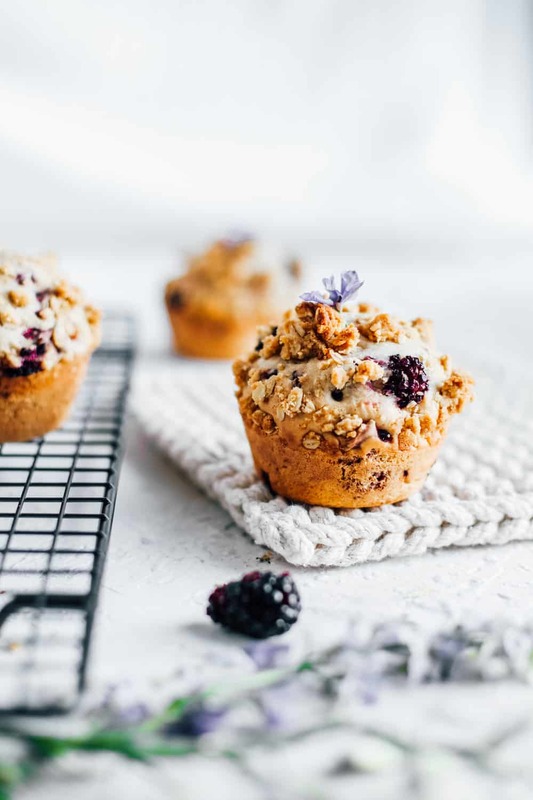 These blackberry and rhubarb crumble muffins are topped with a brown sugary crumble! The crumble is my favorite part. I love a salty-sugary bite on any dessert/backed goods. When it comes to muffins I love to do six jumbo ones but you could certainly make them smaller for 8-10 cupcake size. 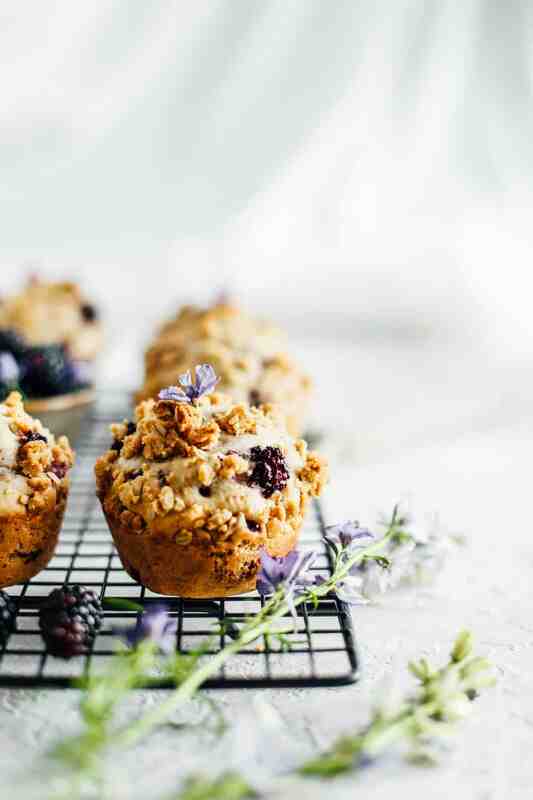 To really show off the blackberry in these muffins I top a few crumbled berries right on top. It looks great for presentation and, more is more! I hope you get a chance to make these muffins this spring. 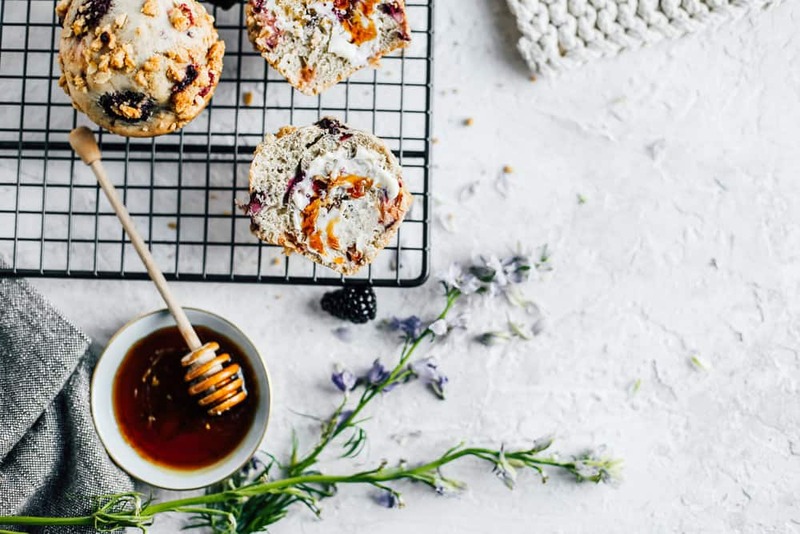 Not only will your house smell amazing, they will becoming a spring brunch staple for you! For oat crumble topping: Mix flour, brown sugar, oats, cinnamon, and salt in a small bowl. Add melted butter and blend with a fork. Mixture should be sandy and not creamy. Set aside for topping with muffins. For muffins: In a large bowl whisk together flour, baking powder, cinnamon, and salt until well blended. 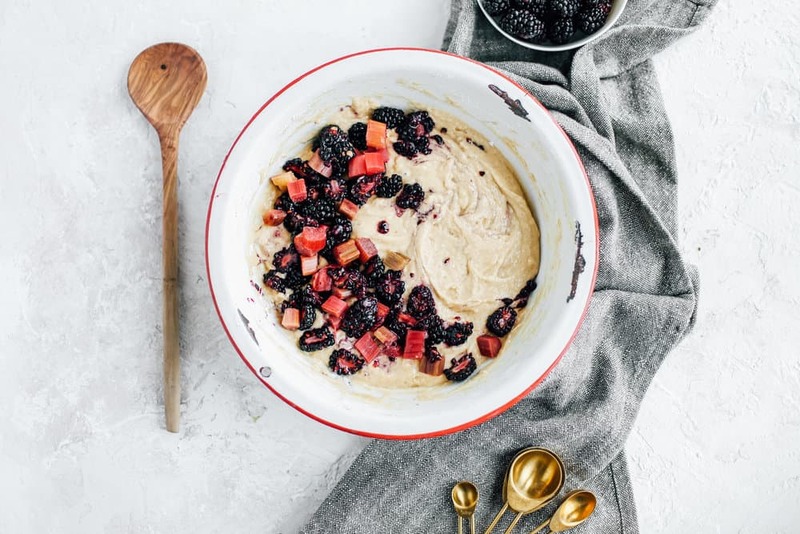 In a medium sized bowl whisk together sugar, oil, eggs, vanilla extract and almond milk. Add wet mixture into dry mixture in three separate increments. Be careful not to over mix. Add in blackberries and rhubarb to batter and mix once more or until just incorporated. Pour batter evenly into cupcake tins and top with a small handful (1/4 cup) of crumble topping to each muffin. Bake for 5 minutes at 425 degrees and then reduce temp to 350 degrees. Bake for an additional 20-25 minutes or until the tops are golden brown and a toothpick comes out cleanly. A soft, light and fluffy eggnog cinnamon roll recipe that will give Cinnabon a run for their money! These eggnog spiced cinnamon rolls are the perfect treat for Christmas morning breakfast! Pumpkin Spice French Toast is one of my favorite easy fall breakfast recipes! This brunch french toast recipe is laced with pumpkin, cinnamon and topped with a decadent whipped maple butter. This is a perfect recipe for slow fall mornings cozied up with your favorite blanket and a Halloween movie! Enjoy! Happy first day of Spring! We’re kicking off the season with these blackberry rhubarb crumble muffins! They are the easiest and greatest brunch addition this spring! Perfect for Easter brunch, Mother’s Day Brunch, you name it! Easy lemon chia seed pancakes filled with fresh lemon juice and healthy nuts and seeds. This healthier version of classic pancakes is the perfect Sunday morning recipe! Stratas are like a wholesome quiche filled with delicious cubes of bread. Very cozy and great for winter brunches. This particular one is filled out with browned butter mushrooms, shallots and lots of mozzarella, parmesan and goat cheese! The Best Christmas Morning Brunch Menu! Cinnamon Rolls, Pomegranate Mimosas and more! Today I am kicking our Christmas Morning Brunch Menu off with these overnight cinnamon rolls that will make your Christmas morning so much easier! I wanted these cinnamon rolls to taste like pecan pie and apple pie had a baby. And they 100% do. (note* be sure to buy extra butter this week). This blueberry peach brioche french toast recipe is an easy oven baked French toast that makes brunch for a crowd so simple!